By Bill Tuck. Donations go to UC Regents. Minimum donation is $2. Any amount above $2 is tax-deductible. 100% of project revenue goes to UC Regents. Bill Tuck will be notified of your name and donation amount. Songs written by Bill Tuck, produced by Dan Drilling, and performed by musicians and vocalists at Panda Productions of Nashville. 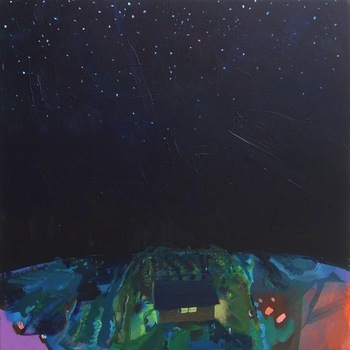 Cover art: Mitch Temple, A Home at the End of the World, Acrylic on canvas. All revenue from sales goes to UC Regents to provide funding split evenly between the two following mentoring programs at the University of California, Davis (UC Davis). Thank you for your generous support! High School Apprenticeship Program (HSAP) in the Department of Physics at UC Davis provides summer internships to local students from River City High School in Sacramento, California. The goal of HSAP is to introduce high school students to university laboratories, research techniques, and scientific computer programming. Under the guidance of university researchers, interns apply their training to specific projects focused on solving current problems in solid state physics. At the end of the 4-week program, interns give presentations on their research and results in a ceremony attended by their families. Mentorships for Undergraduate Research Participants in the Physical and Mathematical Sciences (MURPPS) is a UC Davis undergraduate mentoring program designed to increase the number of underrepresented students who pursue graduate studies in the physical and mathematical sciences by offering students the chance to work with professors on research projects relevant to their major. The goal of MURPPS is to help create a diverse post-graduate population in the Physical and Mathematical Sciences.